In this fifth book in the series, Beloved Horses From Around the World, equines demonstrate their wisdom, their will to live when facing death and their unconditional love. In Beloved Horses From Around the World equines demonstrate their wisdom, their will to live when facing death and their unconditional love. Meet Rosey, a Thorougbred who gives freedom for a soldier injured in Iraq. Jessie, a Morgan, defies the odds when severely injured. Comet, a Rocky Mountain Horse, fulfills a bride’s dream. 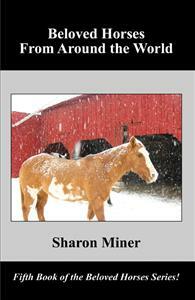 Equines from Canada, Aruba and England are also featured in this fifth book of the Beloved Horses series. Enjoyed by horse lovers of all ages, the books are illustrated collections of true horse stories describing the special bonds between horses and their riders.